Home smartphone Technology Is Apple preparing a foldable iPhone? Is Apple preparing a foldable iPhone? A long-time issue, Samsung's famous folding screen mobile phone could finally come up in the course of 2018. No wonder then that one of the main competitors of the South Korean company is also on ranks. The foldable screen iPhone, a reality in the making? There are many rumors about the iPhone range lately. We had the wind of the hypothesis of the launch of a few months of 3 new models of iPhone X. 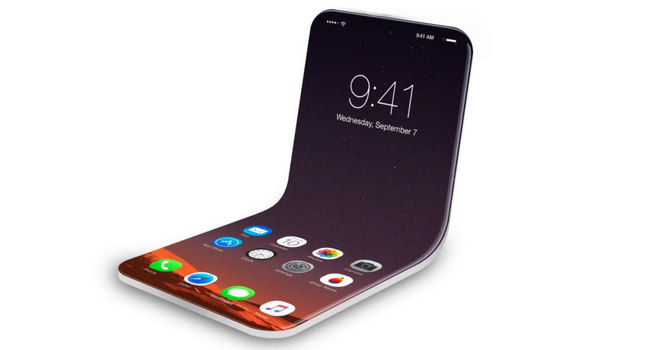 And now we hear that Apple's supposed willingness to do in the flexible screen phone. An iPhone whose screen could be folded at will and by extended extension, such would be the new perspective of the Cupertino company. If nothing has obviously been confirmed yet, the office of the US Patent and Trademark has just published a patent filed by Apple, on a phone whose screen, you guessed it, could be folded. Featuring a futuristic design (even though it recalls the famous clamshell mobiles in vogue in the early 2000s) and enjoying a seemingly borderless screen, this iPhone is presented as follows on the patent in question: " A electronic device that could inherit a flexible portion, allowing it to be folded. The terminal could have a flexible screen. The flexible screen could have a foldable area, allowing the screen to be bent on an axis when the device is folded " . The same patent also refers to LCD, OLED and microLED technologies, as well as touch sensors. Some sources report the possibility of seeing such an iPhone invest the market not in 2018, but rather by 2021 .